Last month during Paris Games Week, Sony showed off a new Detroit: Become Human trailer. The violence shown within the new trailer has caused quite the controversy with some criticizing the use of violence to sell their game. Now however, the lead writer for the highly anticipated title, Adam Williams, is responding to the controversy. Dam Esther Rantzen, founder of Childline, has called Sony and Quantic Dreams out for their upcoming title, saying that “Violence against children is not entertainment. It’s not a game. It’s a real nightmare for thousands of children who have to live through these kinds of scenarios. The makers of this game should be thoroughly ashamed. I think it’s perverse. 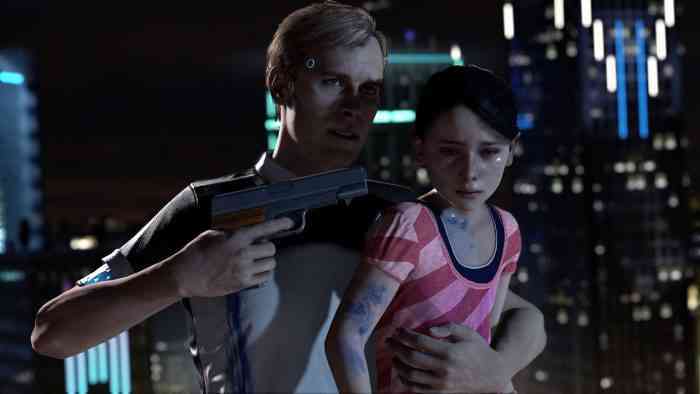 Who thinks beating a child of entertainment?” In a recent interview with Gamereactor, the lead writer for Detroit: Become Human responded to the criticism about the game, and discussed how the game is set to deal with a lot of complex issues. Williams calls other forms of entertainment to the conversation, saying that if a movie or book would deal with serious themes, there is no reason why these themes can’t also be tackled within a game. “When we started working on Detroit: Become Human, we didn’t just decide to create a sequence like the one we showed at Paris Games Week, but that’s where the story took us. We are telling something with depth, and if a movie or a book wouldn’t shy from exploring these themes, then we see no reason for a game to shy away either. We believe that games are a medium that should explore adult themes, as long as we take our responsibility as creators seriously, on what we should or should not show. It has never been our intention to promote or glorify these themes.” You can find the trailer that is under fire below. What do you think about the controversy surrounding the violence found in Detroit: Become Human? Is there cause for concern that the game normalizes violence or do you think that the developers are truly just trying to stimulate conversation about some horrifying issues within our society? Let us know in the comments below and keep it locked for updates.